There has been a mill in Ballyconnell, Co. Cavan since the early 1700s when James Benison, who also owned a 500 acre estate, established a flax mill in the town. National Archives indicate that this was on the site of the AW Ennis Ltd mill. Further to this, mapping of the area carried out by Architects Taylor and Skinner, suggests that the purpose of the mill changed from flax to flour milling by the summer of 1777, shown in the map below. The only structures in Ballyconnell at this time were two houses, Tomregan Catholic Church and the mill. 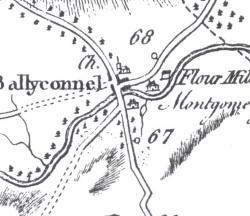 Seen below in the map is Ballyconnell House south of the Woodford River. At the time of mapping, the house was occupied by George Montgomery, whose family had owned parts of Ballyconnell since 1724. Also shown is Mount Pleasant House, owned by James Benison himself. This house is still in the hands of the Ennis family to this day. The Benisons were an important family in the area due to their contribution to the local economy, but that didnt prevent them being subject to petty crime, as described in this article taken from the Anglo-Celt in 1853. James Benisons daughter, Josephine, married Tom Arnold who was the grandfather of the famous English Poet Matthew Arnold and son of Dr. Thomas Arnold, the headmaster of Rugby Public School who appears as head master in the book "Tom Brown's Schooldays". Robert Burton Benison, son of John. J and Marie Benison and grandson of James Benison, became Second Lieutenant of the Second Battalion Connaught Rangers and fought in the First World War. Tragically, Robert was killed in action on 20th September 1914 at the age of 23 years. His grave is in the Vendresse British Cemetry in Aisne, France. The Ennis family can trace our connections back to 1836 when the Laings assumed control of the mill from the Benisons. Thanks to the families of the Benisons, Laings and Ennis' there has been a milling business in Co. Cavan for nearly 300 years, serving customers throughout Ireland and supporting many families in the North-East of Ireland. Click on the tabs below to learn more about the history of A.W. Ennis Ltd.
Milling started in Ballyconnell early in the 18th Century, the mills were built at a waterfall on the woodford river. Known as the Manor Mills and operated by a family named Benison for the manufacture of flour and oatmeal. They dependant almost solely on water for their working existence. A large water wheel provided power for the comparatively Primitive machinery then in use while, as there were no roads unless of a sort which could be used at transport routes, supplies were brought all the way from Ballyshannon by inland water ways and by road from Ballyhaise by horse drawn carts. Within the inland waterways there were a series of lochs which permitted artificial control of the water level and as the flat creaking vessels arrived at the mill the water was raised to ground level so that cargo could be easily unloaded in the field which slopes downhill from the mills. The mills changed hands from the Benison family to the Clancy family early in the last quarter of the 18thCentury, after about 25 years they were sold to a Mr Murphy. It wasn’t until 1836 when another change took place and this time the new mill owner was Mr James Laing. James had spent many years owning and running a flour milling business in Armagh town before making the brave decision to purchase Manor Mills in Ballyconnell, Co. Cavan. This would indicate that the Ennis family’s milling tradition spans back to the late 1700’s. James Laing from Co. Armagh took over and changed the name to Laing’s Mills. James was the great great grandfather of the current Ennis family. Between 1846 and 1850 the owner borrowed close to £1000 from the Board of Works for the purpose of erecting two new water wheels and a maize mill, or a provender. Indeed, James Laing appeared to be a man of the highest humanitarian principles, for the provender mill was installed solely as an attempt to feed the poor during the years of the great famine. Old records show that the price of yellow meal at that time was no more than 16/- per cwt, and certainly although maize was poor substitute for a balanced diet, the mill must have done much to assuage the misery of people living at best on the verge of starvation. His influence on the town and high humanitarian principles are remembered to this day by a street named in his honour, Laing’s Road in Armagh town. William Laing assumed control of his father’s business and continued milling until 1910. By 1910, a tendency to specialise in various branches of milling had manifested itself strongly. Within a year of him taking over the business, Victor Laing had closed the flour department and devoted the mills to the development of oatmeal and provender products. The mills were overhauled in 1926 and among the new machines installed was 15 horsepower turbine. In 1931, Victor Laing decided to retire, leaving the business in the hands of his nephew, Mr. A. W. Ennis. 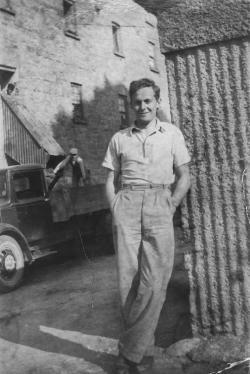 Mr. Arthur W. Ennis, at the age of twenty-one, assumed complete control of the Ballyconnell Mills, as they were known at the time. Before taking on this role, Arthur gained extensive experience working not only for his uncle, but also for Patton’s Mill in Monaghan, where he received valuable grounding in the industry during his time there. 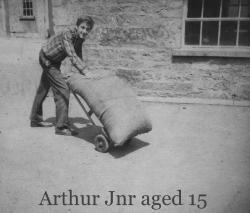 Arthur ran the Ballyconnell Mills for over a decade during challenging times. After the Second World War, food supply was scarce and the population began to rise. During this time, Arthur recognised the trend changing towards complete specialisation and decided to cease production of oatmeal and concentrate on maize products. The mills were modernised to facilitate specialisation. State of the art maize flaking, grinding and compound mixing plants were installed, as well as an ESB motor in case of power failure. A large quantity of new machinery was installed, including up to date maize flaking, grinding and compound mixing plants. Separate units were provided for each machine, as well as ESB motors to assist the turbine in case of power failure. The old four storey stone building, which despite its age, was uncommonly bright inside, was divided into three main sections. All raw materials were brought from the nearby railway station by lorry and deposited in the ground-floor store. From there, the grain elevator took them to the warehouse where they were stored in four tonne bins. The century old Ballyconnell Mill continued to cater for the needs of the surrounding counties, Cavan, Leitrim, Longford and Monaghan. Arthur second enterprise was the purchase of David Malone Mills at Lower Sean McDermott Street in Dublin, serving a wide region stretching from Co. Galway to Co. Wexford. Housed in an old church believed to have been built for one of the Dukes of Gloucester, the Dublin mills were purchased by Arthur in 1956, on the retirement of David Malone to Killiney. The historic building was used for feed manufacturing for many years, but there remained to be a clause in the deeds forbidding the manufacture of candles, tinwork, tanning or any other activity which might, by sound or scent inconvenience the residents of the neighbourhood, namely the nuns in the Magdelene Laundry next door. These premises were later known as A.W. Ennis (Dublin) Ltd. This expansion allowed the company to focus on poultry feed, which coincided with the onset intensification of agriculture, particularly of the pig and poultry sectors. A stone mill in Mountmellick, Co. Laois was the base for A.W. Ennis (Mountmellick) Ltd. This was the site for pig feed milling. Of course, A.W. Ennis Ltd was not immune to occasional mis-haps. 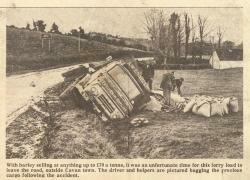 During the 1960s, a quick minded individual (and appropiately placed given the distinct lack of cameras compared to today...) caught on camera an unfortunate incident involving a lorry loaded with barley and a very muddy verge. With barley selling for anything up to £70 a tonne (a lot of money back then), the driver and several helpers were determined to bag the precious cargo following the accident. 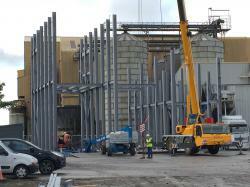 A specialist dairy coarse feed plant was built in Ballyconnell, which was the first of its kind in Ireland. The coarse feed range, known as Krunch, is still popular today. A fire at the original Ballyconnell mill broke out during the night. Oak beams and floors in the massive four storey building burnt for three days before finally extinguishing. This brought to a close milling within this stone building, which had stood the test of time for over 150 years. Production levels increased from 100 tonnes per week to over 800 from the mid-1950s.This lead to the realisation that another expansion was needed. A greenfield site in Virginia, Co. Cavan, identified by Arthur Snr. years previously, was purchased for the location of a new state of the art 100,000 tonne per year pig, poultry and ruminant feed mill. He sadly never got to see the Virginia mill site purchased or running. This would replace the Mountmellick Mill which had closed several years previously, and also the Dublin mill, which was now at its full milling capacity. Partial funding for this new venture was provided by IDA Ireland and FEOGA. A micro-addition plant was installed in the Virginia mill, which was capable of adding over 20 vitamin and mineral products, as well as prescribed medications into various finished feeds. In the UK and Ireland, the general industry standards, known as ISO 9000, were in use for quality management and assurance, However, A.W. Ennis made a commercial decision to implement a novel industry quality standard, known as HACCP (hazard analysis critical control point). This system is now the norm in feed milling as well as many other industries. A.W. Ennis may well have been the first European mill to use HACCP as an industry standard. The Virginia mill began to expand more into the ruminant sector, and installed ruminant sieving bins, out-loading bins and liquid spraying, as well as the addition of an extra 200 tonnes of storage capacity. With production levels exceeding 2000 tonnes per week, a new office block was built on the Virginia site, to facilitate the increased work load on office staff and record keeping. The untimely death of General Manager Sydney Higgins shocked and saddened all who knew him. As an integral part of A.W. Ennis for many years, Sydney was a member of the family. "Sydney Higgins: A friend to all"
After several salmonella scares within the European poultry industry, along with E.U. feed regulation changes, the Irish government decided to heat-treat all its poultry feed to destroy salmonella before it reached the farms. A heat treated mash plant, the largest of its kind in Ireland and funded by E.U. grants, was built at the Virginia mill, to facilitate the manufacture of heat-treated, salmonella free poultry diets. Partial funding for the project was granted by Intra-Egg Ireland. With tonnage increasing, extra storage was needed. A 20,000 square foot warehouse facility was built to allow expansion and increased storage of bagged feed. With increasing fuel and labour costs, as well as the high level of duplication between the Ballyconnell and Virginia mills, with extreme regret and sadness for the family, a commercial decision had to be made to close the Ballyconnell mill. This was to preserve the survival of its overall milling business. The Ennis family made a firm commitment to restructure and rationalise their milling operation to keep it as competitive as other mills within Ireland. This was one of the most difficult decisions the family has had to make, as not only did they lose 22 loyal staff members, but they also had to accept the loss of nearly 200 years of milling in Ballyconnell where it all started in 1836. Click here to read a poem about the closure of the Ballyconnell mill, written by Fintan Brough. After five years, the move is almost complete. Today, nearly all of the plant and equipment has been moved to Virginia, and the current mill is now producing over 200,000 tonnes of animal feed per year. A.W. Ennis has recently been granted full planning permission for an additional state of the art milling plant at the Virginia site dedicated to the manufacture of biosecure poultry feed. Our project team have worked tirelessly to ensure the safe and efficient build of the mill and to finally see the structure taking shape is fantastic!